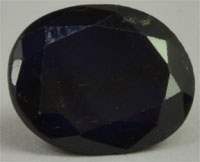 Blue sapphire Gemstone is also called as Neelam, Nelashma, neelratna, Shaniratna, Indraneel etc. In Persian it is called as Yakoot or Kabood. 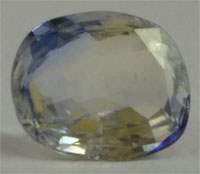 It is Corundum and comes in many other colours as well. It is the stone for Planet Saturn and it represents discipline, ambition, honesty, perfection, humility, elders, adversity, accidents, conservatism and dutifulness. 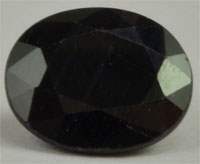 If shani is benefic in a horoscope , one should definately wear this gemstone. It is a very strong gem. It's wearing purifies the mind. The mind is charged with virtuous thoughts and positive attitude. 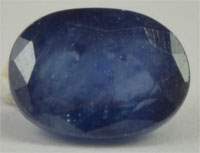 Sapphire is worn to protect one from evil effect of Saturn. Saturn can Dignified(Benefic) and Debilitated(Malefic) in a Horoscope. It makes one Prudent, contemplative, cautions, responsible, precise, persistent, persevering, industrious, economical, reserved, serious, resolute, considerate, mathematical, temperate, chaste and executive. It makes one Skeptical, melancholic, deceitful, incompetent, exacting, avaricious, perverse, indifferent, laborious, impotent, secretive, suspicious, fearful, slow, callous, lewd, pessimistic and unreliable. 1. The stone is said to be increasing eyesight, longevity, and blood flow to organs. 2. It helps decrease rheumatism, sciatica, neurology, epilepsy, hysteria, tumour, reduces fat, arthritis, nerve pains, mental illness, petrochemical, radiation miasms, excessive bleeding, emotional pain and trauma, haemorrhage. 3. It provides balance to intestinal tract, pancreas, lower spinal column, heart, blood, and adrenals. 4. It can be worn with a great advantage by heart patients. 5. The gem has miraculous and magical powers in healing all sorts of disease of the brain and stomach. 1. It adds wealth, widens the sphere of one's influence on other people particularly if one is dealing with the masses. 2. There is also an increase in social status and prosperity. 3. Saturn controls most diseases in the body; by wearing it, one is assured of a long and healthy life. 4. This is a very useful gem for higher studies and research work as it gives concentration of mind, perfection, precision and willingness to work more. 5. It also protects the wearers against risks of accidents and against the dangers of fire, strom and natural calamites. 6. It protects the wearer from unexpected happenings and ensures greater financial statbilty. 7. It can cause sudden upturn in business and change the life pattern of the wearer for good. Who should wear it ? a) It is very useful for persons born in Taurus, Libra, Capricorn and Aquarius ascendant, provided Saturn is well placed in 3rd, 6th, 10th or 11th house. c) Legal professionals, yogic exercises and persons involved in various acts of union, engineers, mine workers or in metallurgy may be immensely benefited by wearing it. d) It will be useful and beneficial to those in whose chart, Saturn is lord of auspicious house or is Yogkaraka i.e. for Taurus, Libra, Capricorn and Aquarius. e) It will give results to a limited scale for Aries, Gemini, Virgo and Scorpio Lagna. If Saturn is exalted, Digbali or forms "Sasa Yoga or Viranch Yoga" (Jupiter, Saturn and 5th lord in own, altation sign in Kendra/ Trikone), it will be extra-useful. f) It should be worn in Dasha- Antar Dasha period of Saturn. g) As per Varahmihir in "Brihat Jatak": If Saturn occupies Lagna in any of the sign Sagittarius, Pisces, Aquarius, Capricorn or Libra, the native will be equal to a king, headman of a village or a great scholar and handsome. Therefore in such nativity, wearing it will be very auspicious. h) Those in jobs connected with stones, clay, cement, land, mines, minerals, iron, coal, petrol, oil, hides, skins, leather, agriculture, masonry, brick making, mill, factories, sculptures, machine tools, pathologist, labour leader, public leaders, social workers, judges, magistrates or elected heads of village / towns or state should wear it. Officials of insurance deptt., welfare/ charitable institution, recruitment board, employment exchange, labour/ personal deptt., and those in services may wear it. i) Native suffering form bone cancer, diseases of nerves, gouts, paralytic etc. may also wear this gem. Their concentrated violet cosmic rays are ideal cure for nervous and mental disorders and all forms of nerve pain anywhere in the body. 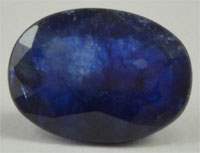 Substitutes: The substitute are Lajvart, Amethyst and Firoza and these should be thrice the weight of Sapphire indicated as per the birth chart. Compatibility: It is compatible with Emerald and Diamond and almost equal weight can give astonishing results provided the related planets are well placed. It can be worn with Seven Mukhi Rudraksha and Fourteen Mukhi Rudraksha. It should never be worn with Ruby, Red Coral and Pearl, as these are antidotes to this stone. It is too cold and, as such, it should be worn in the middle finger of left hand. It is worn in middle finger in silver ring on Saturday morning or when Anuradha, Pushya and Uttara Bhadrapad Nakshatras are rising, free from Bhadra, after purification i.e. Energzing. Good quality is found in Burma, Sri Lanka and India. 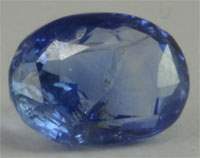 The best Indian Sapphire is cornflower blue and is found in Jammu and Kashmir. Montana in USA also produces it. 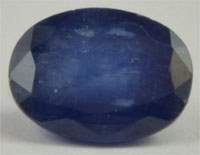 Cambodia, Brazil, Kenya, Malawi and Colombia also produce this sapphire. 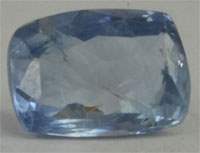 The sapphire has hardness of 9, specific gravity 4.00, refractive index 1.76-1.77 with a Trigonal crystal structure. Natural gem shines by its own rays and does not borrow light. It is very smooth and the colour has special effect as if emerging out of its core.